In 2016, 11% of cybersecurity experts were women. Girl Scouts will soon be adding new cookies to their collection — your Internet history. The youth organization known for Thin Mints and Samoas is teaming up with Palo Alto Networks to bring cybersecurity education to potentially millions of girls. This partnership is a way to break down gender barriers in the technology world, fill a much-needed employment gap in the cybersecurity industry, and get youth members ready for an increasingly digitized future. 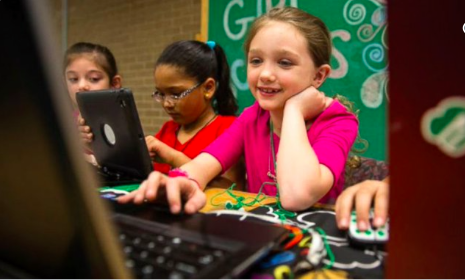 “We recognize that in our increasingly tech-driven world, future generations must possess the skills to navigate the complexities and inherent challenges of the cyber realm,” Sylvia Acevedo, chief executive officer, Girl Scouts of the USA, said in a statement. By 2021, it’s estimated that there will be 3.5 million job openings in the industry, but many experts fear that there won’t be enough workers to meet the demand, partly because not enough women are entering the field. In 2016, just 11% of cybersecurity experts were women. A big reason for this disparity, according to a report by the Computing Technology Industry Association, is because women are not aware of the career options available to them. The new Girl Scouts program wants to level the playing field for young girls. After all, Boy Scouts can already pursue cyber courses. A series of 18 badges will be released in 2018 to incentivize girls to learn about STEM subjects (science, technology, engineering, and math), including cybersecurity. Current badges cover a range of areas, from cookie sales to justice, and this new slate might motivate girls to master a challenging subject. “Our collaboration with Girl Scouts of the USA to develop curriculum for the first-ever national cybersecurity badges will positively influence the future of our industry by helping build tomorrow’s diverse and innovative team of problem solvers equipped to counter emerging cyberthreats,” Mark D. McLaughlin, chairman and chief executive officer, Palo Alto Networks said in a statement. Cybersecurity is widely considered a “top national security threat.” The relatively arcane subject received significant attention during the 2016 US presidential campaign when Russian hackers were accused of hacking the Democratic National Committee. Girl Scout coders won’t solve this problem overnight. But the organization, which boasts 1.8 million current members, has a long history of producing highly successful women — from astronauts to army generals to nonprofit pioneers. In the decades ahead, perhaps a major cybersecurity breakthrough will be the work of a former Girl Scout.